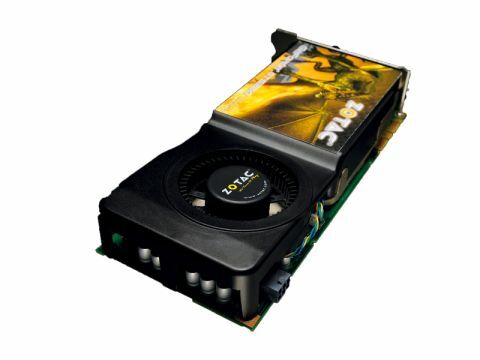 The latest addition to the GeForce family seems to repeat the same model as AMD's HD4770. The GTS 250's core features fewer shader processors than the full fat 260s and 275s of this world, but runs at extremely high speeds to compensate. Actually, though, if you look a little closer, the 250 is yet another rebrand of the 8800/9800, with yet another 150MHz or so piled onto the clockspeed, an extra half gig of memory and a launch price of £130-ish. The chip must be having a real identity crisis, no longer sure if it's an 8 or 9-series or GT-thing. Quite how Nvidia hoped to get away with that when the generationally different GTX260 is kicking around for less than £100 at least one e-tailer we saw is baffling. It seems to exist entirely independently of the rest of the market, throwing in a performance that's akin to the much cheaper Radeon HD4850. There must be a global surplus of G92 chips somewhere that Nvidia is desperate to offload on the unsuspecting. If, this Christmas, when Nvidia announces its DirectX11 line-up there's another rebranded 8800 bringing up the rear, we won't be surprised. It does, however, explain why this is a big, noisy card for the amount of power it produces. After all, the original 8800GTX was a monstrous beast, yet it ran at slower clockspeeds than this. Initial reactions ran something along the lines of 'what's the point?' Convinced there must be one, we looked harder – and failed to find it. Perhaps some insightful reader can enlighten us – maybe running three of these in triple SLI turns out to be excellent value for money? It had better be, because buying a single one just seems like a complete and utter waste.